Techline summary article - are you feeling a vibration in the steering wheel while braking? we¿re aware of this issue and are currently looking for a solution. Techline summary article - we?re currently looking at an issue that when connected to bluetooth® handsfreelink® using an iphone with ios 11, there?s no phonebook showing up on the on demand multi-use display? (odmd). 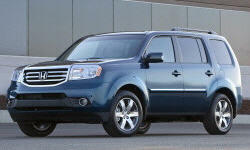 Dealer message - american honda (ahm) has discovered that certain 2015 pilot vehicles may have wrong key fobs included. ahm would like to request to inspect and repair if needed. please check vin list and inspection procedure below. Dealer message - ahm is investigating customer complaints of the seat bottom heater not working. please send specific parts to ahm prior to attempting a repair of any kind. Techline summary article - are you feeling a vibration in the steering wheel while braking? we¿re aware of this concern and are currently looking for a solution. Honda: the door handles, on outside, would stick during operation and an investigation is under way for the cause of the condition on certain vehicles. model 2015 pilot.